The preposition per is a Latin word meaning by, through. It entered the English literary language in combination with certain Latin nouns, e. g.
Later per began to be used in English with the meanings by, by means of, through, by the action of, e. g.
The old Latin word combinations are rarely used today except in legal or official documents. Care of (c/o) is usually written on letters (telegrams, packages, etc) before the name of the person to whose house (office, etc) a letter (a telegram, etc) to another person is sent. Mr. Smith c/o Brown & Co. Фирме Браун и Кo для передачи мистеру Смиту. 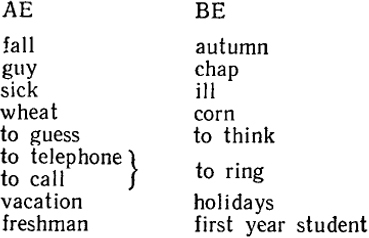 The examples above illustrate some lexical (1), spelling (2) and grammatical (3) peculiarities of American English (AE) as compared with British English (BE). British and American English are considered to be variants of the same language. They display a number of differences in pronunciation, vocabulary, grammar and spelling. But obvious as they are, these differences in no way violate the whole system of the English language. The differences in pronunciation are of a most systematic character. They immediately identify a speaker as belonging to the one community or to the other, Yet even so, there is no doubt that the phonetic system is essentially identical for the two variants. The greater proportion of English vocabulary is also common to both variants of English. There are, however, quite a large number of cases in which different words are used in BE and AE to denote similar ideas and objects, e. g.
Spelling differences are fairly systematic too. The following list includes examples of the main types of spelling differences. The number of grammatical differences turns out to be rather small. They have to do with some verbal forms, prepositions, articles, e. g.
Do you have .,.? (In the meaning "Do you own or possess at this moment?") Have you got ...? The examples given above do not cover every possible difference in vocabulary, grammar, spelling between BE and AE. What is important to bear in mind is that these differences are not so numerous and fundamental as to consider British and American English two' separate languages. The more so that nowadays the differences are getting fewer due to the extensive penetration of Americanisms into BE and vice versa. The predicate in adverbial clauses of purpose introduced by the conjunctions so, so that, in order that is generally expressed by can/could + infinitive or may/might + infinitive . Professor Fox invited Erik to his house so that he could meet the other members of the staff. Профессор Фокс пригласил Эрика к себе, чтобы тот встретился с другими сотрудниками лаборатории. He decided to see Dennis home so that they might talk in private. Он решил проводить Денниса, чтобы поговорить с ним наедине. Note: In negative sentences should + infinitive is more common. "I won't invite anyone so that you should not be disturbed," said Mrs. Thayer. «Я не буду никого приглашать, чтобы вас не беспокоили», - сказала миссис Тейер. ... this hunch of yours puts the matter in a different light. In Modern English a demonstrative (negative,, interrogative, etc) and a possessive pronoun cannot be used together. When they are both needed, the possessive pronoun in its absolute form is placed after the noun and is preceded by the preposition of. This dog of yours barked all through the night. Эта ваша собака лаяла всю ночь. This is no fault of his. Это не его вина. We may also find a noun in the possessive case in place of the possessive pronoun. I don't like this friend of Allan's. Мне не нравится этот друг Аллана. Note: The structure this ... of yours, Allan's is often used to lend the phrase negative emotional colouring; it may express irritation, displeasure or dissatisfaction. This aunt of yours is spying on us. Эта ваша тетка за нами шпионит. Note: When the indefinite article stands before a noun followed by of + possessive, the phrase has the meaning of one of ... . I thought he was a friend of your sister. Я думала, он друг вашей сестры (один из друзей). A neighbour of mine has seen the film. He liked it very much. Один мой сосед видел этот фильм. Он ему очень понравился. I memorized it and can repeat it word for word. In set phrases consisting of noun + prep + noun when the nouns are the same, no article is necessary. 1. ... taking him around the place and showing him his shrubbery. I'll take him around and then bring him back. Я похожу с ним и все ему покажу, а потом приведу его обратно. 2. ... you will be left to amuse yourself. I know my pictures are not good. But I paint because it amuses me. ... я рисую потому, что получаю удовольствие от этого. How will -you amuse yourself while I'm away? Чем ты будешь заниматься, пока меня не будет? She amused herself by mimicking Joe to them. Она развлекалась тем, что передразнивала Джо перед ними. To entertain is mostly used in the meaning of to receive people as guests; to show hospitality - принимать гостей; оказывать гостеприимство; устраивать приемы (гостей). We seldom entertain. У нас редко бывают гости. They liked to entertain. Они гостеприимны. Они очень любят принимать гостей. They entertained a great deal last year. У них постоянно бывали гости в прошлом году. 3. ... but he sank into the soft, nice chair and again opened the book. to sink vi - allow oneself to fall - опускаться, падать; (also fig) замереть, упасть, ёкнуть и т. п. She sank into a chair and burst out crying. Она опустилась (упала) на стул и расплакалась. His heart sank at the thought of failure. У него замерло (упало, ёкнуло) сердце при мысли о неудаче. Her spirits (her courage) sank. Она упала духом (мужество покинуло ее). Today's paper gives further details of the accident. Сегодняшняя газета дает дальнейшие подробности происшествия. Tell me what happened in a few words. You needn't go into details. Расскажите в нескольких словах, что произошло. Не нужно вдаваться в подробности. Не loves to talk about his travels in great detail. Он очень любит подробно (обстоятельно, детально) рассказывать о своих путешествиях. 5. "Don't you care for cheese, Mr. Drake?" to care for smb, smth - have a liking, fondness or affection for (usu in neg & inter sentences) - питать интерес, любовь к кому-л., к чему-л. Do you think she really cares for him? Вы полагаете, она действительно его любит? If she had cared for him she wouldn't have left him. Если бы она действительно его любила, она бы не оставила его. I don't care for such books. Я не интересуюсь такими книгами. to care to do smth - like, wish to do (usu in neg & inter sentences) - хотеть сделать что-л. Would you care to read this article? Вы хотите прочесть эту статью? I don't care to hear your excuses. Я не намерен выслушивать ваши извинения. 1 don't care much about going there. Мне не так уж хочется туда идти. I don't care (about) what he thinks about me. Мне безразлично, что он думает обо мне. He failed in the examination, but he doesn't care. Он провалился на экзамене, но это его не тревожит (трогает). 6. "I'll bet you don't," said Mrs. Thayer. I'll bet you wouldn't dare to go there alone. Держу пари, вы 'бы не осмелились пойти туда одна! to bet smb smth. - спорить, держать пари с кем-л. на что-л. I bet you a bar of chocolate that Tom will win the race. Спорю с тобой на плитку шоколада, что. Том выиграет скачки. Не made a bet that he would reach the top of the hill before any of the others. Он поспорил (заключил пари), что доберется до вершины холма раньше всех. Higgins made a bet with Pickering that Eliza would speak perfect English in six months. Хиггинс заключил пари с Пиккерингом, что Элиза будет прекрасно говорить по-английски через шесть месяцев. Не lost his bet. Он проиграл пари. Higgins had no doubt that he would win the bet. Хиггинс не сомневался, что выиграет пари. 7. "You haven't any excuse," I reminded him. There is no excuse for it. Это непростительно. That's not much of an excuse. Это не оправдание. What is your excuse for being late? Чем вы можете объяснить ваше опоздание? Не had numerous excuses to offer for being late. У него нашлось много отговорок, чтобы оправдать свое опоздание. Excuse me for coming late (my coming late). Извините меня за опоздание. 1 find it hard to excuse his conduct. Трудно найти оправдание его поведению. I'll forgive you this time. Such things are not easily forgiven. На этот раз я вас прощаю. Такие вещи не так легко прощаются. to forgive smb, smth - прощать кому-л. что-л. She never forgave him the insult. Она так и не простила ему этого оскорбления. He was forgiven for speaking rudely to his sister. Его простили за то, что он грубо разговаривал с сестрой. to apologize to smb for (doing) smth - извиниться перед кем-л. за что-л. Elsie apologized to her teacher for coming to school late. Элси извинилась перед учителем, что опоздала на занятия. . I must apologize (to you). I forgot to ring you up yesterday, as I had promised. Я должен извиниться (перед вами). Я забыл позвонить вам вчера, как обещал. If it is necessary for a person to apologize for what he has said or done, he says "Please, excuse me (for) ..." or "I (must) apologize, I didn't mean that." When speaking of the incident later, he or someone else uses only the verb to apologize.